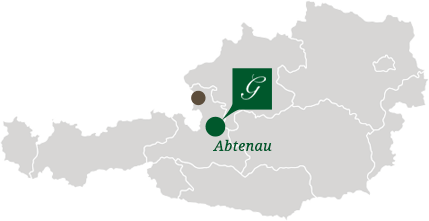 Restaurant Hotel Gutjahr in Abtenau: Enjoy culinary delights at the highest level! Culinary highlights – heavenly pleasures: in our four-star Hotel Gutjahr in the Salzburg Land you will be spoilt with excellence, our delicacies are created with loving attention to detail, that melt on our guests´ gourmet tongues. Our chef Barbara Gutjahr is personally responsible. Whether incomparably light and soft aromas or fully flavored and substantial: Barbara Gutjahr, together with her dedicated culinary team, prepares fantastic culinary treats, that not only spoil your palate but also pamper all your senses. In our restaurant we serve carefully selected and delicious dishes on lovely decorated tables, that will wait for you in our well groomed winter garden as well as in our restaurant. In the highest state of perfection, our delicacies from our kitchen will be topped with our generous wine list with selected premium wines from our own vinotheque. At our Hotel bar, your host Markus Gutjahr will serve you the right aperitif, a cold Pils or a soothing schnapps. All these balanced ingredients transform your restaurant visit into a culinary experience for all your senses!